Available for purchase and pick up in salon. Offer available until 24th December 2016. Augusta's Dermal Clinic is now offering specialised Plasma Lift Therapy and HIFU Treatments. Have a facelift without the surgery - that means no downtime and no needles, just amazing results. Augusta’s Dermal Clinic is a one of a kind beauty service enabling our clients to experience the highest quality in beauty therapy for that busy cosmopolitan lifestyle. Located in the Augusta Village shopping precinct in Augustine Heights, why not indulge in a beauty treatment after a hard day of retail therapy? With beauty treatments available for both men and women, there is a service just for you. 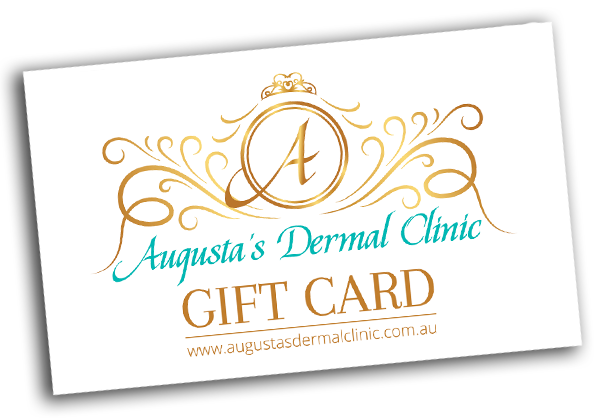 Augusta’s Dermal Clinic also offers customised gift vouchers for those very special occasions. Augusta’s Dermal Clinic prides itself on not only working on our beauty on the outside but also from within, we are much more than beauty therapists we are skin health technicians that believe your most important attribute is clear healthy skin. All emotion is reflected through the skin, we address this issue with our long term experience, product knowledge and accumulated expertise to create wellness, wellbeing and confidence. We offer much more than one step treatments, we provide a detailed process to address problematic skin conditions or for the lifelong maintenance of healthy radiant skin. Using the latest in Cold Laser Hair Removal (SHR) Super Skin Rejuvenation (SSR) (intense light therapy), Intraceuticals oxygen skin infusion technology, microdermabrasion and skin needling we can confidently offer multilayered treatment plans which cater for your specific skin type. So come in and put yourself in the hands of our highly experienced , trained and caring staff , you will not be disappointed. microdermabrasion and laser hair removal to relaxing massages. Augusta's Dermal Clinic has all your beauty needs covered in one place. Augusta's Dermal Clinic now has a specialised massage therapist. Offering services in Remedial Massage, Bowen Therapy, Sports, Pregnancy, Relaxation, Hot Stone and Thai Massage. Our 100% organic Vitamin A peel renews skin, Fades Hyperpigmentation and Boosts Collagen levels. Get instant, painfree results. I have been going to Kerri for many years, and have always been extremely pleased with the results. It is the only place I go for a spray tan, very even, natural colour and doesn’t go patchy. I also have had waxing and now laser hair removal and am very pleased with the results. The highlight for me would definitely be Kerri’s Augusta Signature Facial. OMG, it’s heaven!!! Kerri certainly has magic fingers. It feels like a complete indulgence, the massage is incredible, you come out feeling totally relaxed with fabulous skin. In fact, I am now 51 and my skin hasn’t looked this good in years!! Seeing Kerri is the best decision I have ever made for my skin. Thank you Kerri for introducing me to the Augustas Signature Facial, an addictive state of spiritual proportions. I liken this experience to melting into, and becoming one with the cosmic energy of the universe. If that seems a little ‘heady’ then think deep relaxation and the feeling of absolute bliss. I’ve been a salon client for many years now. My beauty journey has gone from waxing to cold laser therapy for both hair removal & skin rejuvenation. While at first I was a little skeptical about the results for the laser hair removal, I’m so glad I gave it a go. The pain is non existent; & already. I now only have maintenance a couple of times a year. I treat myself to a facial every now & then & quite apart from the amazing benefits for my skin, Kerri’s facial rivals any massage I’ve ever had for relaxation. Since beginning the super skin rejuvenation & oxygen treatments the improvement & clarity of my skin is VERY obvious. While I didn’t feel my skin was too bad to start with, I’ve had a number of comments on how beautiful my skin is looking. My husband even asked me what I was doing different because my skin is feeling so soft & smooth. I am using the intraceuticals skin care range at home now & it feels such a treat – like Im giving myself a spa treatment every day. I can’t praise Kerri enough. she really does know what she’s talking about. I’m so glad I bit the bullet & followed her recommendations. I am actually confident in my own skin now. I can’t finish up without a mention of Kerri’s amazing massage. Kerri has patiently gained the trust of my adult daughter who has numerous disabilities which cause her to be very high strung most of the time. In 29yrs I have never seen her so relaxed as after Kerri’s famous massage. She gets so relaxed she looks just this side of a twilight anaesthetic. From the bottom of my heart, thank you Kerri. You cannot know what a difference you have made to both my daughter & I.
Kerri is a stand out professional in her field of expertise. She has been my beauty/dermal therapist for close to 20 years. As an owner/operator, she is committed to providing great service and results each and every time. I trust her implicity; and have come to rely on her honesty, skill and dedication. Over the years, I have watched Kerri develop from a newly qualified beauty therapist, to a highly skilled and experienced dermal professional. She is committed to staying at the top of her field through professional development activities such as research, and training in new technologies, products and services. I have come to know Kerri as an astute and fair minded business woman, with a down to earth approach that instantly puts you at ease. I would not hesitate to recommend Kerri to anyone wanting a great dermal therapist. She is more than capable of performing complex treatments safely, and to get you great results. I cannot speak highly enough of this woman. It is an absolute pleasure to provide this reference, and I am happy to speak to anyone who has questions or is seeking additional reassurance.